Gardening with children is a magical process. It provides the chance to be open to all types of possibilities for creation, whether it is letting go of order and watching the organic process happen or listening to the sweet chatter that develops between children and adults. Recently, I spent some brilliant time at my daughters fabulous preschool Cuddletime Preschool in Milwaukie, Oregon building fabulous fairy gardens. 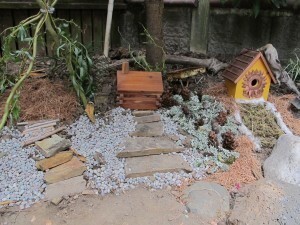 I was a bit curious how to build fairy gardens with 12 kids under the age of 5. 1) Have families collect items for the fairy gardens and talking about fairies and their home prior to the day of construction so that material is on hand and the kids are invested prior to actually building the Fairy gardens. 2) Have your sites picked out and clear prior to engaging the kids. This is because as soon as kids are ready to garden, they are ready! 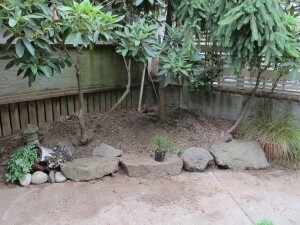 3) Layout and organize all the fun construction material in an area that is close to the garden sites, but also in a flat area so kids can access the material in a safe and easy manner. 4) Bring the children into the area and give them a “pre-construction” tour of where the areas are, what materials are going to be used, and who is working where. 5) Have 3-4 children helping in each Fairy Garden area. Too many children in one area can be too congested. REMEMBER: children have a limited attention span. They are good for 15-20 minute when gardening (and that is optimistic). 6) The leaders of the construction areas should be prepared to give each child a job to gather a certain material, and explain where to place it and what to gather next. Children of young ages like to have a task and like being helpers, so be ready for that. It goes fast and furious for a bit, but that is gardening with children and that is when magic happens…Enjoy and see what happens!